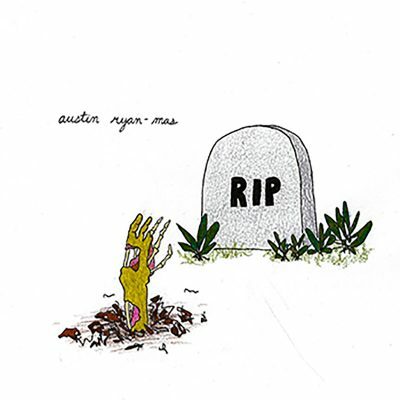 Local Review: Austin Ryan-Mas – R.I.P. R.I.P. sounds like a breakup album. It’s brokenhearted throughout, and filled with poignant observations about someone whom singer/songwriter Austin Ryan-Mas was fond of at one point—perhaps still. The five track EP isn’t nearly as complex as the emotions involved in the lyrical subject matter, but it’s not at a detriment to the overall product. Most songs are just Ryan-Mas with his guitar and not much else, and it works well. Immediately, Ryan-Mas’ vocal delivery reminded me of Bright Eyes by, telling of observations so seemingly trivial but certainly bound to have been taken for granted in the future. I always loved that about Conor Oberst, his ability to be present in a painful moment—possibly making its recollection even more so—but OK with its beauty. Ryan-Mas exhibits those sensibilities, and they are on full display during R.I.P.’s brief runtime. For example, “R.I.P. 2 U & Me” has this line about driving by a former lover’s house and seeing an expiring jack-o-lantern on the porch with its lips curling, wondering what secrets the old gourd was keeping. Those lyrics paint a vivid picture, all the way to the minute details. The EP sounds lo-fi overall, in a good, Daniel Johnston-type way. It sounds almost like it was recorded in a tin box. The engineering and production match the lonesome-singer-plucking-sadly-at-his-guitar imagery that I have in my mind. It also helps emphasize the lyrics. The opener, “The End of Tour,” is my favorite song. It’s honest and unflinching, and most certainly sparked my interest. Everything on the album isn’t sad-sack and ho-hum, though. “So Next Time We Break Up…” is upbeat, and the defiant tone is what conjures recollections of Johnston with his nasally voice and storytelling abilities.